The ISU Performing Arts Series will host a Valentine's celebration featuring Jason Farnham on Feb. 12, sponsored by the Terre Haute Savings Bank. Farnham is a lifetime pianist who has grown from basic piano at the age of four, to classical training and jazz band, to learning to play by ear and creating his own renditions of classic songs as well as originals. Farnham is widely known for his exciting concerts as he plays his favorite tunes standing up, upside down and backwards. 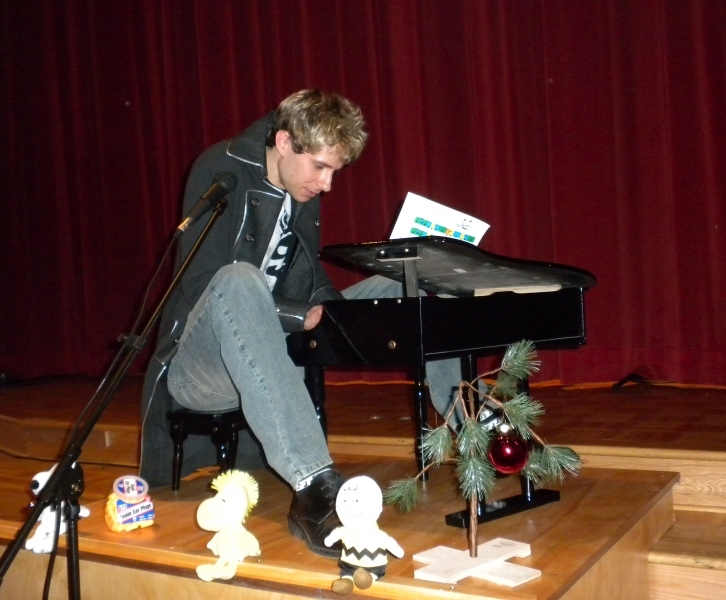 He has been affectionately dubbed as "Schroeder" from Peanuts because in addition to his nontraditional playing styles, he also plays on a toy piano. His piano comedy antics and the clever way he interacts with the audience makes Farnham's performances unlike any other. A fun evening of comedy and piano music sponsored by Pepsi will make for perfect Valentine's celebration. A special ticketed pre-event dinner will be served before the show beginning at 5:30 p.m. in the Heritage Ballroom. Advance tickets and reservations are required to attend the pre-event dinner and are $14 for adults and $6 for youth (ages 2-12). The menu offered will include a choice of meat or a vegetarian option. A children's menu will also be served. The deadline to order dinner tickets and reserve your seat is Friday, Feb. 7. For dinner tickets and reservations, go to the Hulman Center Ticket Office or call 1-877-ISU-TIXS. Adult tickets are $14-$16, faculty and staff tickets are $11-$13, youth (ages 2-12) are $5, and all ISU students are admitted to all shows for free when presenting their valid ISU ID. Tickets are available at the Hulman Center Ticket Office (at our new location inside Tirey Hall on ISU campus), by phone at 1-800-745-3000, or online at ticketmaster.com. For direct phone orders or group discounts of ten or more call 1-877-ISU-TIXS. For more information visit www.hulmancenter.org. Valentine's celebration will feature Jason Farnham on Feb. 12, sponsored by the Terre Haute Savings Bank.